A house engulfed in fire, a first aid cross, a man and a woman holding the hands of a small girl between them and Hitler’s poop – these are some of the many colourful chalk illustrations covering a wall in the Citizens Theatre intimate Circle Studio, that all feature in due course in Alistair McDowall’s Captain Amazing. The touching story of a young, awkward man called Mark (Nicholas Ralph) falling in love and then into fatherhood unfortunately gets slightly lost amidst the animated, wacky episodes featuring Mark’s alter-ego, Captain Amazing, and a bunch of other superheroes. Mark is anxious and lacks confidence, whereas Captain Amazing is somersaulting across the space, fearless and full of energy. In addition to performing these two highly differing characters, Nicholas Ralph plays everyone else, carrying out dialogues between him and his girlfriend or his daughter (or both!) in which subtle changes in his manner and voice indicate which character is speaking. This is no easy feat, yet during the first half of the performance it is often unclear who is saying which line. However, Ralph certainly grows into it, and is at his best in the scenes with his daughter Emily. Here, the difficulty of, and determination to be, a good father are subtle yet convincing. The use of different coloured crayons to construct the backdrop is innovative, especially as objects spoken about in the text are drawn during the play – the flowers Mark’s girlfriend brings, the hopscotch Mark and Emily play on at her first day of school, and the hospital drip connected to Emily’s arm as she keeps being sick. It conveys the playfulness and creativity of children that one has to acquire when becoming a dad. There is, however, a sense that this could have been exploited more. 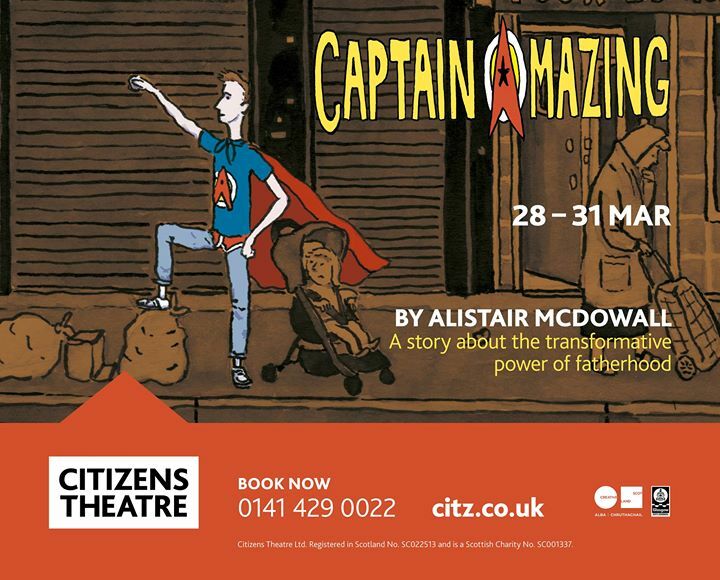 While the play certainly delivers in exploring fatherhood and has well-accomplished comedic elements in its portrayal of a modern relationship, in other parts its humour is too silly, and plainly lacking for those audience members who have little prior knowledge about superheroes.